Well then, if I must. 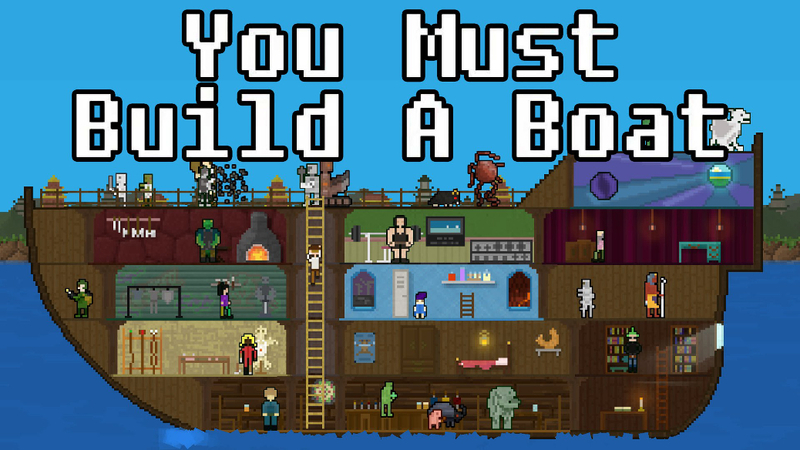 You Must Build a Boat had me addicted like no other for the better part of a month. The puzzle/role-playing game is the sequel to 10000000, which I knew much of but unfortunately, ignored. In hindsight, that may have been a boon as this game only amplifies the concepts of that game, and may have worn out its welcome if I just played 10000000. 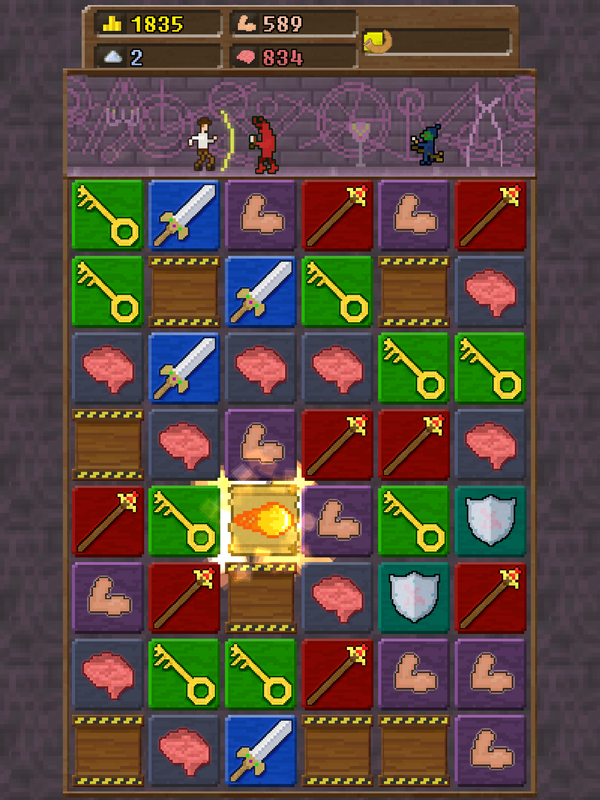 Both games are match-three style puzzlers designed around brief gameplay sessions. However, they incorporate RPG mechanics coaxing long-term play and activating acute pleasure centers in my brain. Notice the division of the screen. When I first started the game, my avatar was on a raft looking vessel with a couple other dudes. Very quickly, they informed my character that his mission was to, yep, build a boat! At this point the game transitioned to what would become a very familiar screen over the next half-dozen hours. The top twenty percent featured my explorer in a dungeon. He would run through dungeons encountering enemies, traps, and treasure chests. The bottom twenty percent consisted of the tiles that I would match by swiping columns up or down and rows left and right. Matched icons would cause my adventurer to react correspondingly. 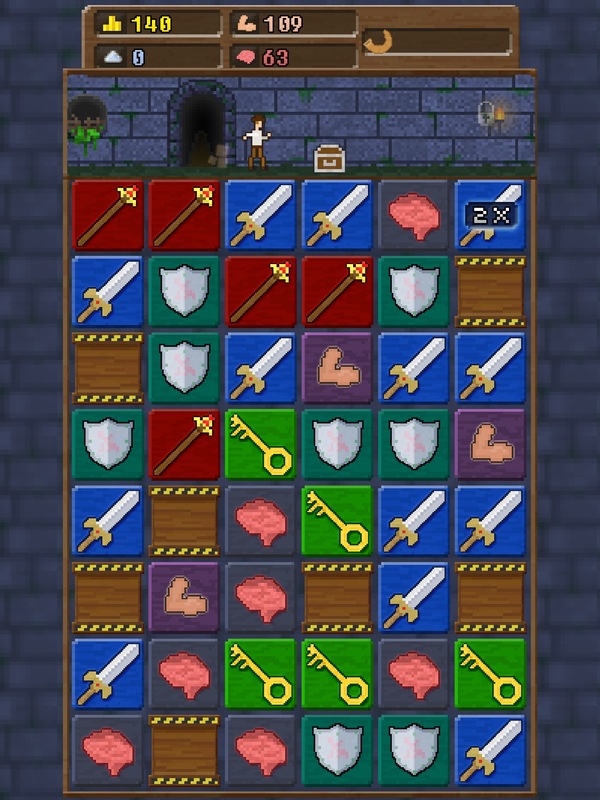 If I matched key tiles, he’d unlock a treasure chest. Likewise, if I matched swords or staves, he’d attack physically or with magic. Each run of a dungeon would end when my character reached the edge of the screen. I had to react quickly enough to his obstacles as the screen never stopped scrolling, even if he did. When it eventually did, I would arrive back on the ever-expanding boat with a constantly growing staff. Back here, I could spend the coin I’d accumulated and increase the effectiveness of the tiles, recruit monsters for permanent stat boosts, and much more. The tile-matching was very responsive to my touch and fun in itself, but coupled with the sort of gameplay loop found in an RPG and then consolidated into a six hour experience instead of a sixty-hour experience and this wound up being a game I could hardly put down. Now that I’ve completed it though, I don’t feel like going back. Or rather, I have and don’t want to repeat the cycle from square one. Upon completion it prompts to start at the beginning albeit with a stiffer challenge. I haven’t found that sufficient motivation to begin anew, although I am picking it every now and then; I’m just putting it down much easier. Nonetheless, I spent roughly seven hours with it on my first go-around and I could’ve probably done that all at once. Excluding the grinding I did at the very end. That grew tedious. Other than that fact, this game is well-worth the paltry asking price.